While the table makes a good reference to quickly find out how much a certain armor reduction gives to your %dmg increase, there are two simple trends you will observe which is far more useful than the table itself. 2. The efficiency range, denoted by the green-red bands, increases as the Armor reduction value increases. You'd want to hit a value within the green band as much as possible. The highest value demarkated by the blue box would be the peak efficiency. diaz_leon (some of you may remember) came up with a solution to find the peak value. With these two simple information in mind, I can easily estimate the dmg increase I would expect without much calculation or usage of scary graph models and tables. I find that effectively, I am dealing 680 worth of raw dmg in one single hit assuming the opponent's armor falls under the effective green band. Aside from making quick calculations, it makes it easier to analyse armor reduction abilities and skills. A shadow priest's ultimate of (-12, -18, -24 Armor) can be viewed as (+75%, +117.5%, +150%dmg). A slardar's ultimate of (-5, -10, -15 Armor) becomes (+33%, +66%, +100%dmg). Again this assumes the target armor falls under the effective band. Its quite easy to relate to certain skills as well such as those that gives +increased dmg like Magnus' Empower (+60%), Command auras (+36%), and others. 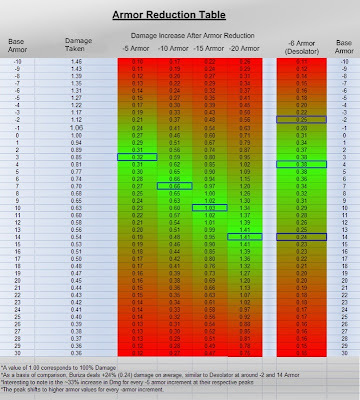 Unlike Armor reduction however pure dmg increase (such as +60dmg from Deso) will not be amplified. All these while I had difficulty in quantifying the effectiveness of armor reduction. 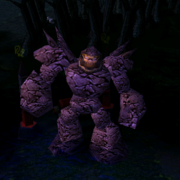 If you ask me about Slardar's ultimate. I'll describe it as Level 1 = Some bonus dmg, Level 2 = lots of bonus dmg, Level 3 = LOTs more bonus dmg. In a similar way, you will find it highly irritating if Tinker's laser description for Level 1/2/3/4 is "Deals small/moderate/high/v.high pure damage". You would want exact numbers to relate better. Strategy wise, if youre a Sniper buying a desolator, make sure someone in your team has some form of armor reduction abilities/items as well. Else in late game when the opponents armor are buffed, your armor reduction effectiveness will deteriorate into the red band. And oooh... the effectiveness of Deso SF looks clearer now, -4 from aura and -6 from deso gives about +60%dmg. Off the top of my head, I was wondering if a SP + DP combo would work out well. A level 3 weave (average -12 armor cos of the -1/-2/-3...-24) gives approximately +75%dmg boost to spirits (each does about 49dmg iirc) from DP. And Grave can be used on DP when she gets focused. Alternatively, a slardar. Unfortunately, strategies revolving around armor reduction has never been popular. AoE stuns/disables/nukes, chain stunning, carries are what makes a team game. Hopefully there is more emphasis on Armor reduction strategies in the times to come. Some changes in armor reduction mechanics would be nice, like maybe affecting buildings partially. And probably new Armor-oriented heroes. -15 + -6 + -5 + -3 + - 12 + -18 = -49 armor? w0w! thats great!